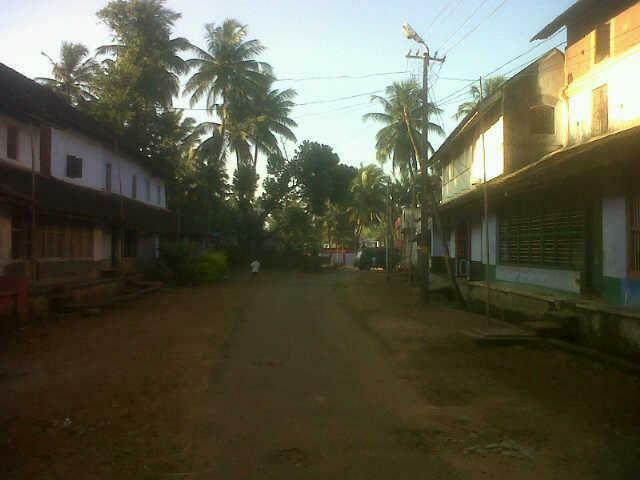 Faint notes of ‘Saamajavaragamana’ struck me, when I stood at the reception of Dakshinachitra to buy an entry pass. This krithi in Hindolam is by Saint Sri Thyagaraja, who lived in the 18th century A.D. The fragrance of agarbaththis wafted through the air, bringing with it the scent of Arali (Nerium) flowers. All these eased me up for a laid-back walk inside Dakshinachitra. Dakshinachitra is nothing like a conventional museum. The absence of glass-covered artefacts and long corridors can confuse anybody. Reconstructed traditional houses from the four south Indian states of Tamil Nadu, Kerala, Karnataka and Andhra Pradesh find their places here. Dakshinachitra is a walk through the memory lanes of our ancestors and the lives they lived. Checking my pass in, I crossed over a small archway, to see the vast expanse of land. Huge canopies lined up along stony pathways. A tiny market made its presence felt, thanks to the bling that were up for sale. All the old houses that are replicated in Dakshinachitra are bought from the contractors who are assigned to demolish them by their owners. More often than not, the owners want a modern house in the places of these old houses and hence sell them off. “We do extensive research on the background of the house and its people and try our best to recreate it here,” says Sharath Nambiar, Deputy Director of Dakshinachitra. My favourite was the Chuttillu House, which sadly is placed at the fag end of the trail. Found in the coastal areas of Andhra Pradesh, the structure in Dakshinachitra was specifically from Yelamanchilli, Vishakapatnam district. These houses are made of mud and circular. They have thatched roof that extends until the ground, in order to drain off the water, from the incessant rains that the storms bring. These roofs are built at an angle of at least 45 degrees to drain the rainwater away. The round shape of the building is to combat the raging winds, which are usual in the coastal districts of Andhra Pradesh. The Chettiar house from Tamil Nadu was another memorable piece. The term ‘Chettinad’ denotes the region Pudukottai, Sivagangai and Ramanathapuram in Tamil Nadu. Trade was their main occupation and it reflected in their lavish lifestyle. Polished wooden interiors, which kept the temperature inside the house in check and a collection of expensive articles that were given as gifts during their weddings vouched for the prosperity of the Chettiars. A typical Chettiar house has a long thinnai , which is the porch at the entrance of the house and an inner open-roof courtyard in the middle of the house. 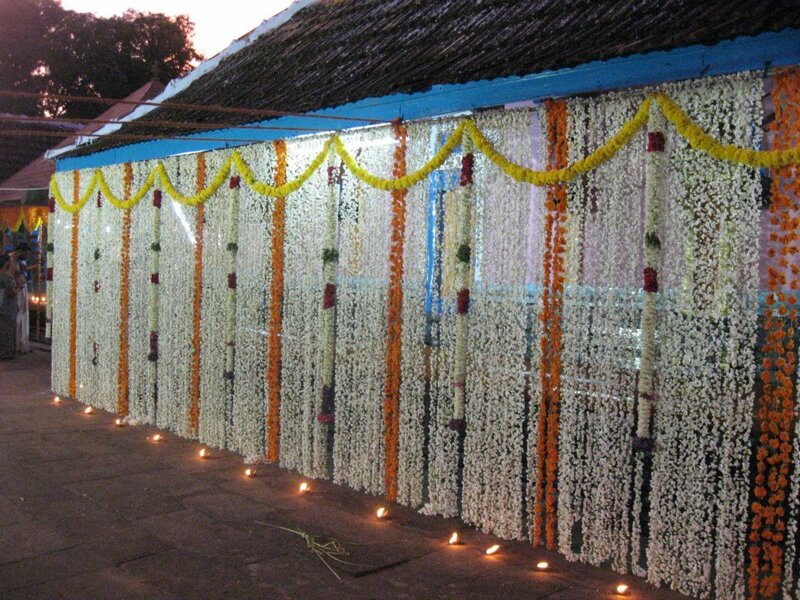 The thinnai is for the men and outsiders to meet and talk while the courtyard is for events that are more intimate. It is the sacred space and is designated only for family members. The Syrian Christian house is characterised by the woodwork, mostly with timber and jackfruit wood, the well in the kitchen and long verandahs. The polished, dark brown wooden walls were attractive and gave a rich texture. These houses had huge granaries too, which were built immediately at the entrance. The Syrian Christians used to pray in front of their granaries and hence their houses were built to store huge quantities of food grains. Their settlements were concentrated in the districts of Kottayam, Kollam and Aluva, mainly in the valley of the river Pamba. Karnataka is a state, whose history is rich. From the mountainous regions of Coorg and Talacauveri to the heritage of Hampi, it has it all. The exhibit of the Chikmagalur house told the story of its original inhabitant, a Muslim trader named M.A.Ismail. The house’s special feature was the patterns in the doorways and windows made of fine limestone. Houses in Chikmagalur are built with varying grades of limestone, found in abundance in Karnataka. The most coarse grade would go to building the base of the building while the finest will be made as floral patterns over doorways. 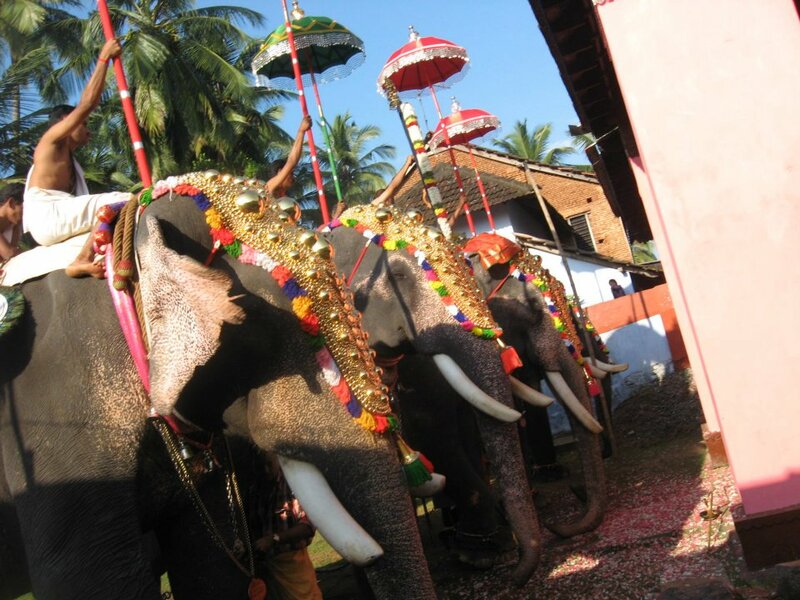 Chikmagalur was populated by Muslim traders, credited for bringing the art of perfume oil extraction from Arabia. On my way out, I stop by Nambiar’s office to ask about the loud voices that sang the basic notes of Carnatic music all along. “We work with a lot of folk performers and expose them to various other styles of dance and theatre,” he says. Dakshinachitra is also planning to hold thematic exhibitions and environment awareness programs to school students who visit the place. I take a quick walk inside the craft shop and being broke, started on my way back home, with loads of memories and pages of heavy notes. 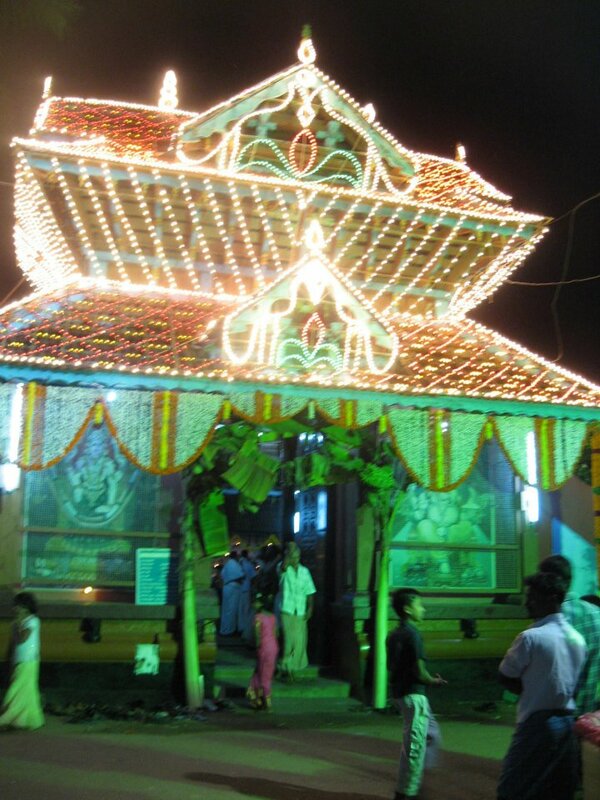 *Dakshinachitra is located on the East Coast Road (ECR), very close to MGM and is well connected by bus. I was fortunate enough to share my childhood with Harry and his friends. I was crazy to an extent that my dreams had me walking in the alleys of Hogwarts and my ultimate ambition in life was to own the robes and the wand. I was a proud Potterhead. Spells, subjects, characters, fan fiction, you name it and I might have known about it already. Then came my tryst with Pottermore. I eagerly browsed through the page, knowing my house ( Ravenclaw) , my wand core ( Dragon heart-string and beach wood 13″ bendy and flexible), my Patronus (Fox) and my Ilvermony House ( Horned Serpent) and then things ran out. I was out of the phase of reading and re-reading HP books, not that I complain about re-reading, but I felt i was past that stage to binge read the books. I love to skim through them, but I guess I am done with intense reading. Then came the movies. I love them. To condense something as long as 600 pages into a movie of 200 minutes is a feat by itself. I do have some serious problems with the casting and the choice of parts that they had to cut out of the movies, but I shall let it go, for now. Be it the books or the movies, there were a few characters, all women, who won me over. Each of them had a uniqueness in them and came across to me to be impressive and adorable. This post is dedicated to those six women in the HP universe who win me over, every single time. Being an “insufferable know-it-all” is basically who she is and she carries that tag with such pride. Closer to the “ugly” end of the beauty scale, she taught me how awesome it is to be intelligent and clever. It feels great to stick by rule books and to boss people around. It is amazing to have people depend on you for solutions and well,if things don’t work out, to say, “I told you so”. I know I am cheeky,but that’s what Hermione was too. A true Gryffindor who faced her worst fears, Hermione always chose friendship over love. She helped me get over my complex of being a ‘know it all’. Grossly misrepresented in the movies as being timid and soft, this firecracker has nerves at all the right places. A skilled caster of the Bat Bogey hex and an excellent Quidditch player, she ended up working for her dream job. She is tough inside out and adds life wherever she goes. She lived her life to the fullest and did not bow down to the pressures of age or gender. Such a lovely, lovely character to read about. She taught me to be unabashed and fearless. A supermom whose skills have been grossly understated in the series until the last part. An exceptional witch in terms of household charms and spells, she is an embodiment of love and care. She is fierce in protecting her children and bossy with her husband. Probably the user of the only “muggle”swear word in the entire series, Molly Weasley is a personification of motherly love. A dubious character, who battles with a lot of demons, Narcissa grew on me towards the end of the series. If it was not for her, I doubt if Harry would have been alive for the famous “Great Hall confrontation” which, by the way, was ruthlessly cut out in the movies, replacing it with the lamest possible encounter between the Most Feared Dark Wizard and The Chosen One ( This betrayal shall never be forgotten or forgiven). I loved it when she walk out at a crucial juncture of the Final war, prioritising what she wanted for her family and herself. Another exhibition of the motherly instinct, I would opine. She probably taught me that it is never too late to do the right thing. Ah! My taboo-crush in the series, this lady has it all. The wily evil smile, the reckless nature, the prowess, the power – everything that any witch/wizard would die for. Her style speaks for itself and frankly this is one of those rare places where the movie scored over the books. Her unapologetic arrogance and a taste for torture makes her scary. I bet nobody would have messed with her in her heydays at Hogwarts. Her liking towards inflicting pain and her glee when she does that makes her one of the most formidable villains ever. She taught me to take pride in whatever I do and also to do it in style. She taught me to live life as it comes and to be proud to be who I am. Harry Potter is a boon if read early on, because the presence of strong women will not surprise a person later on. It will just be a way of life and well, we always have an alternate universe to escape into,in case the real world gets boring. This post is my tribute to my paatu mami, who, in my opinion, is one of the most underrated vocalists I have known. I remeber throwing tantrums from a very young age, to not go for classes. When we had lived in Kerala, there was a bhagavathar who used to come home to teach me music when I was all of four or five years of age. I never liked him. ( Okay, I was a kiddo who, like many others, could be attracted only with colorful candies and toys, and vintage didn’t appeal to me then). I used to say some rubbish reason to escape from the torturous time of singing. Oh! We still have that iconic harmonium in our house,by the way. So yes, when we shifted to Madurai, I was happy. Happy that I have to go through no more of those music lessons and yaay! What more could I ask for? That was when my neighbors changed and Lo! Guess who moved in?? A new Paatu mami. I swear I had no idea even in the wildest of my dreams. I was caught again, in the never ending cycles of swarams and saadhakams. My dad, being the over-enthusiastic appa, was only too happy to send me and bask in the glory of having a pon kondhai who knew to sing properly. Days went by and I progressed with some good credits to my name and two new friends ( Paatu mami’s sons). Mami was very liberal when it came to classes. With the perfect mix of tradition, she infused the classes with a lot of cool factor, like taking turns to sing one part each in the Varnam charanam portion, playing us the cassettes of legends and asking us to identify the raagam, slotting classes early in the morning, especially during Maargazhi so that we could sing Thiruppaavai etc. She had us all try our hands at Kalpana swarams from such young age itself and also the niravals and alapanais. We, the shishyas, used to sit in a semi-circle around her and used to gape at her expertise in doling out the swarams. We also used to squabble for a particular spot to sit. ( Such fight to be the Sheldon Cooper of Paatu Class) She also had both her sons take out their mridangam and violin to practice along with us. It was kind of Katcheri, every day. Not one word she chided us when we took the liberty to play cricket inside the house during the “Before class” and “After class” grace time. Moreover, she kept a check on me if I was doing saadhakam every day ( Being the neighbor helps, you know). I still remember my excitement when my periappa gifted me a Radel Shruti Box and I ran taking it to mami to tune it. I still have the Shruti Box. Years went by and studies happened and relocation happened. Now all I want is to go back to those days where one could drown in such divinity without any other thought to steal our own time and focus. Oh My! Such strong memories and I so miss her and those days now. 😦 I was truly blessed to have such a person in my picture of Music and I am loving it to bits. Being left to live alone creates a big impact on one’s own thoughts and values. The alone time gives the ambiance to revisit all those wonderful times one would have spent with her family. It teaches the value of a person in one’s life and also brings our attention to all those small gestures that go a long way in making or breaking a relationship. I grew up in a very loving and close knit nuclear family. I have been staying outside home for about 8 years now and I remember myself going through a plethora of emotions all these years. Happy, sad, restless, confused, annoyed, jubilant etc, you name it I swear I have had it. The new-found freedom from parents’ watch and the new people around made me go crazy. I am not ashamed to say that I have had my own pitfalls and may-be a lot more “close-shaves” . I have learnt to take care of myself quite well. It was during one of my Coffee-influenced-evening-musings that I started reminiscing about all those beautiful days. I still remember many of my fights and disagreements with both my parents- individually and also together. I remember many small loving gestures that were generously sprinkled all along my days with them. Those lovely signs continue till day. It has been our family tradition to have dinner together. All four of us, no compromises there unless Appa is travelling somewhere. Otherwise, be it my exams, my brother’s tantrums, my Amma’s fatigue, dinnertime was always family time. Some how that has become a habit for us. We wait till all of us arrive from wherever they are held up. We don’t really care about how hot the food is or if the food is leftovers from the afternoon’s lunch. All that we care about is that together we eat. Period. Similarly, Appa and Amma make it a point to have their morning coffee together. It has been 25 years that they are married now and not once in my memory have I seen them have their coffees alone. Amma loves Jasmine flowers and Appa still buys a Mozham of Malli poo everyday for her. This also has been happening since I can remember. I mean, these are all small things, to be honest. But these go a long way in conveying messages than words will ever do. From the time I was a baby, I always gave the first bite of any delicacy or eatable/beverage that I laid my hands on, to Appa. This came out from the fact that I had no sibling then to share anything and Amma and Appa were particular that I be inculcated with the habit of sharing things with others first. This habit continues till date. If I am home and I get something to eat/drink, I give the first bite to Appa ( not Amma, which I still don’t know why).I am 24, for God’s sake, but I adore that look in his face when I do this. Appas are the real babies in this world, you know. They are just too cute. When I visit home, I used to take the Vaigai Express from Chennai which reaches Madurai at around 9 PM. We then have dinner together and Amma and I would sit for our chit-chat which goes on until 1 AM. She is a working woman and she has had a long day by then, but still she sits with to talk about the most boring stuff ever or some random jibber-jabber that I am well-known for. Sitting alone in a huge flat, with nobody to care about you makes a person realize the importance of all these small things. It makes me realize how blessed I am and sets a higher benchmark for me to make up to when I get my own family and all. Many a times we think materials bring happiness. Nope. We could not be more wrong or more shallow. A word of appreciation, a token of love and mere presence is what gives true happiness. Where the heart is content, nothing seems impossible. You might be wondering why I am telling this to you right now. Let me tell you why. It is because I do love you and will always do. It might be a month or two since we ended things but that impact is still fresh and alive in me. I can’t still believe that it is over but hey! love never ends. So I have decided to confess everything that I had felt for you, including what I may have told and things that I may have not told you explicitly. We found each other when Chennai was reeling under floods and hit it off in a matter of days. I never knew then that this would mean so much to me. Never did I think that we would come so far and then become strangers again. It all happened like a hurricane. Quick and devastatingly fast. You were everything that I had ever dreamt of in a guy. Smart, funny, handsome, sarcastic, caring, everything and I know I was like that for you too. I saw you getting more and more comfortable with me, shedding your inhibitions ,opening your heart and baring your soul to me. I loved you with all I had then. You took me to dinners and dates and made me feel all special and pampered. It was all strange for me,yet I enjoyed those moments completely. You stood by me when I was having a tough time in my career and pumped my hopes up when I was on the verge of giving up everything. You made me stay when all I wanted to do was leave and let everything go. I love you for that honey! I remember every small detail that we had spoken over those midnight-untimely phone-calls. Everything from the economic recession to the name of our dog, all of it was out in the open. I admired you each moment we were together. Oh Yes! I altered my lifestyle for the better to make myself ready to be your companion of sorts. Heck, I even ended up googling about food and other cultural traits that were prominent in the region where you came from. I loved you so much! I started seeing my future with you, albeit with a lot of hesitation. I had a colorful past of which you were never bothered. “Present is all that matters” ,you had said. I took it as a sign and went on dreaming our life, without even noticing how “my” had suddenly transformed to the most beautiful word,”our”. I loved “us”! All of a sudden my world came crashing down to earth over a cuppa coffee. Oh! You remembered that I was fond of coffee, even though you knew that this time it was going to be the symbol of misery for me at that point. I never asked you the reason behind that. I will never want to know. I will not want to shatter those images of “us” that I had together drawn. Yes, I still loved “us”! Now, it has been quite a while since that day and I still love my coffee. I do see you being happy in your own world and space and am proud of the way you have carried yourself all through this. I still believe that you were in love with me, just the way I was with you. I still am the same crazy-obnoxious girl, who is much fitter and probably much mature than who I was when we had met. You have given me reasons to practise the art of acceptance in life and not get scared to love anybody. I love you! Don’t you want to ask me if I have moved on? Well, May be. But you will always be that one person whom I would love to love and love to give second,third or innumerable shots at. Love is so much abstract. It comes with no reason. I saw that in “us” and I still am seeing that. You gave me hope and inspired me to be a better version of myself. I love you! Baby, listen. I love you with my entire soul and would have been insanely happy if we had gotten together and grown old.I do understand that how much ever we try, certain things that are not meant to be, will never happen,ever. But, sweetheart, I do love you and I hope you know that. *Written for “Write a love letter campaign by Chennai Bloggers Club”. After All This Time? ALWAYS!! This might sound so hypocritical to you all. I don’t really care. You might even go to the extent to call me pretentious and “peter”. I still don’t care. Alan Rickman is dead. The man who breathed life into a fictional character, the man who I grew up watching and hating ( yes, sadly, Thanks to the plot twists). Severus Snape. That is how many know him. That is how he most probably will go down in history. I have not watched any of his movies other than the Harry Potter series ( I guess I haven’t. I have a poor memory for movies) and I feel void. It is something similar I felt when Sirius, Fred, Lupin and Tonks died. Damn! It reminds me of Dobby’s death. Those were all fictional characters. But here is a man who gave life to such a difficult role which had to conceal so much of his dark past and his loyalty. I highly doubt if anybody else could have portrayed that role of so much enigma and indifference as well as Alan Rickman did. Huge Respects and Rest In Peace, Severus Snape. You will be loved, forever! A quaint lil eatery in Namma Mylapore…..
Mylapore is probably the best place next to Mint street in Chennai to experiment in food and eateries. From high end Eeanglis-ispeakin peter places to the absolute yummy street food kinda places ,one can find all and more in and around Mylapore. One such kutti food point is FOOD POINT. Located on the VM street near Yellow Pages bus stop and Sanskrit college/ Valluvar silai bus stop , this little place is THE go to place to grab a quick bite. Hidden behind the wall and baskets of fruits and bread, this shop is quite famous for its fast food. though it is not a typical hotel type outlet, they do have a few chairs under a few big umbrellas to sit and enjoy the fare. Pocket friendly and tasty, the items here range from Rs.20 to Rs.70. Sandwiches, Toasts and its many many variants, Frankie, Juices, milkshakes, burgers, chaats etc are found in the menu. 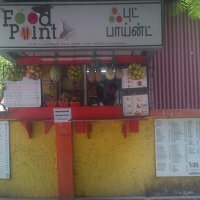 The Food point special items ( categorised so in their Menu itself) and the Bread Omelets are to die for (Personal choice)!! This place has had the reputation of being the lifeline of the inmates of the 358796 hostels found nearby and is always crowded. That’s Puthucode Navarathri for us!!! I just have no idea what really prompted me to draft this post at this time of the year ‘coz i have been saving this one to be posted at the time of Navratri this year. 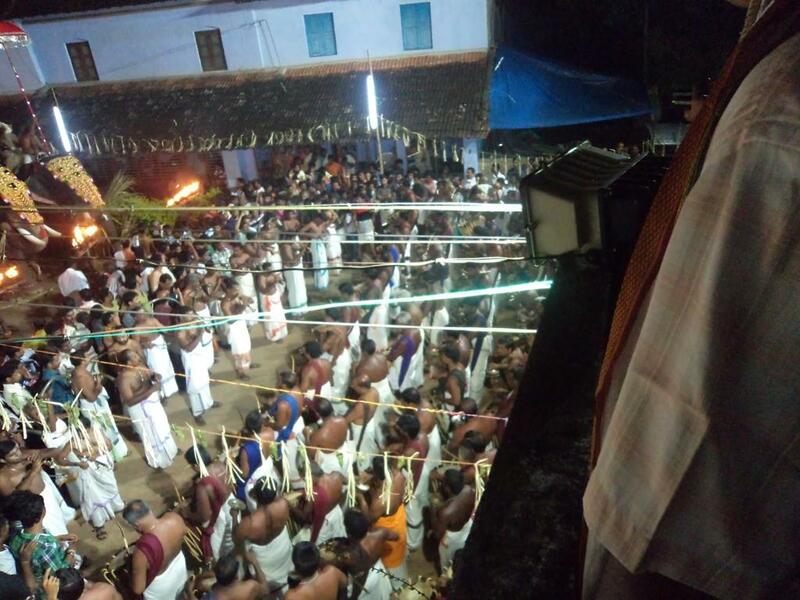 Well, I guess, may be standing witness to a “Shingari Melam” last night in Mylapore might have pulled the trigger off…. Having been born in Puthucode in Kerala and with my close family members still living there, I can never be ashamed to say that we celebrate Navratri in the best way!!!! It is definitely a spectacle to watch atleast once in everybody’s lifetime and I am honored and humbled that I get to be a part of it every single year. The run-up to the festivities starting from Day One till the Vijayadashami day ( Day Ten) , planning for Navaratri every year(a Herculean task) starts months before the actual dates. Inviting donations, making arrangements for everything from scratch.. the Arches, Elephants, Decorations for elephants, Floral decorations, Food and Stay arrangements etc. Navratri starts off with the Ceremonial “kodiyettam” in the temple.The divine flag of Devi is hoisted in the Golden “Kodimaram” ( Flag mast) on the Mahalya Amavasya day after Sunset.And there it goes, its nine full days worth of celebrations due! From the next day onwards, its made sure that the poojas in the temple are done to the dot with every minute detail taken care of. Each of the four villages are given two days each. In these two days , all the poojas, decorations, sadhya ( the feast) and other decors are the responsibilities of those assigned villages. Its apt to say that every village takes these days very seriously and do the best that they can to exhibit the grandeur of the festival. 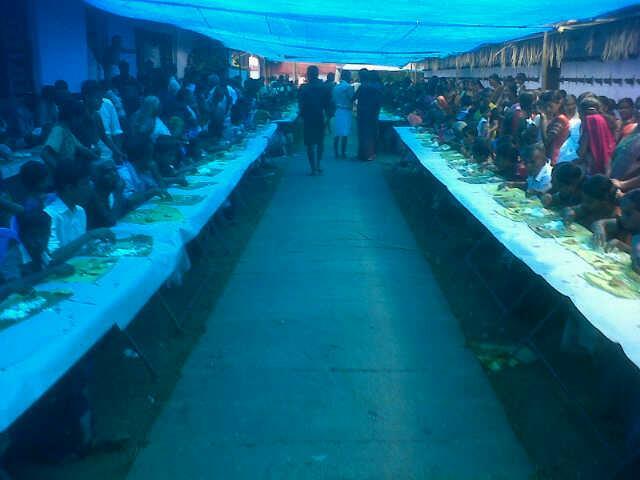 It is literally a competition between the villages and the villagers,to be honest.They provide accommodation to anybody who wishes to stay there during the festival and offer food too. 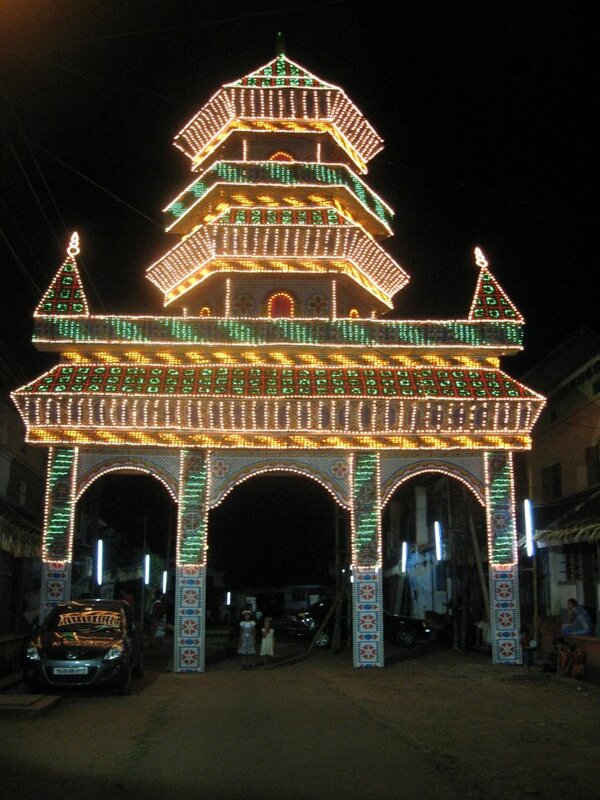 Every village is decorated with an arch with lighting since Day One. 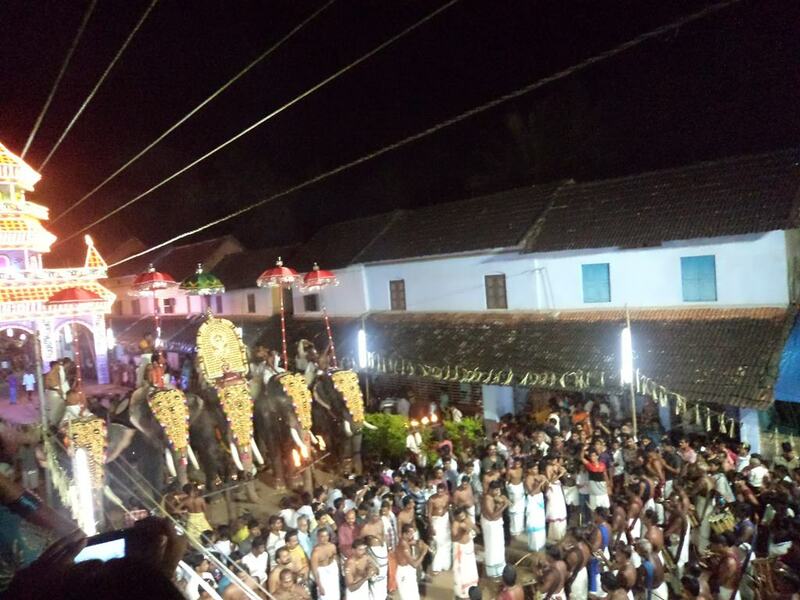 During the Big Vilakku Days, i.e., the sixth, seventh,eighth and the ninth days, elephants are brought from various places and adorned with all possible Chamayam and paraded through the length of the streets. 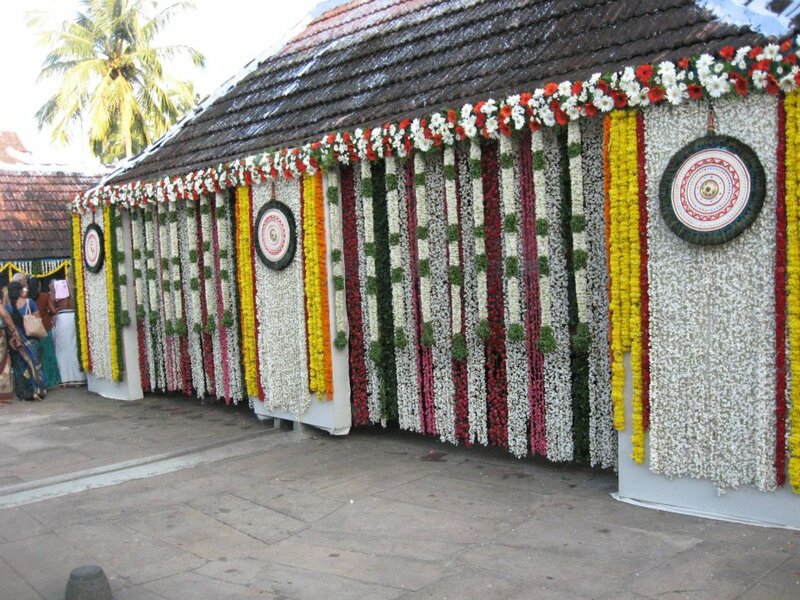 The temple decoration is the best during these days and its totally worth it even if we get to stand in long,winding queues to get the blissful darshan of the Divine Mother. Its just beautiful to see The Mother always smiling during all of these 10 days. There will be very little sight of bare temple walls during these days as flowers and lighted lamps adorn the temple completely. 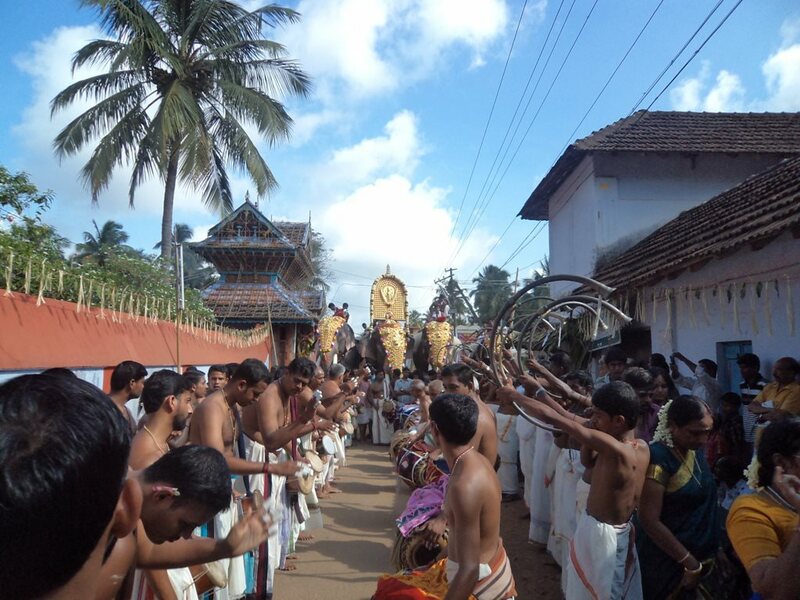 A typical vilakku day starts with the Devi Aarattu early in the morning and proceeds with the Ezhunnalath. 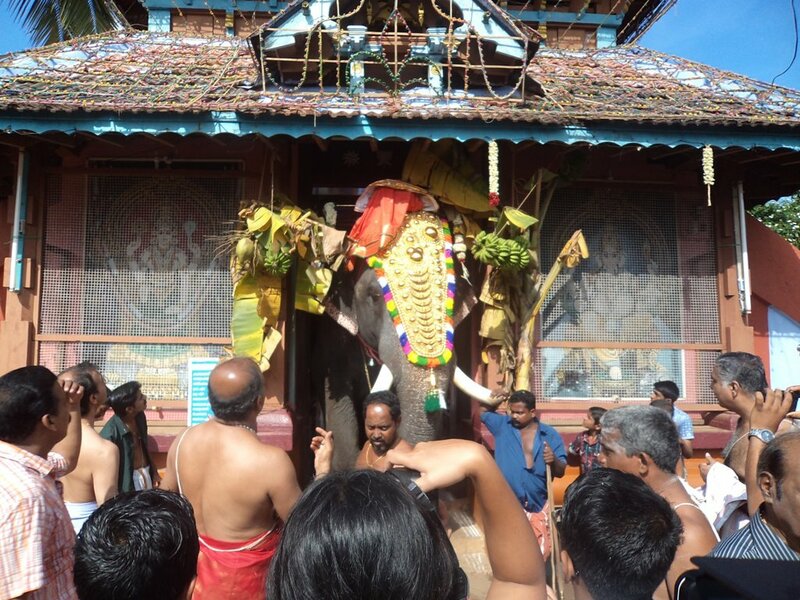 The tallest elephant in the group is blessed with the Thedambu ( An ensemble with the idol of the Divine Mother) and paraded through the village along with other elephants and the panchavadyam and melam. Come the lunch hour and its guaranteed mammoth line in front of the Agrashaala. The Pulingari( A gravy of pumpkin, jaggery and a variety of spices and coconut) of Puthucode is very famous and people from everywhere wait to have a morsel of rice mixed with pulingari.A simple lunch is complemented with the best of the Payasams make it an unforgettable feast one might ever have had in their lives. 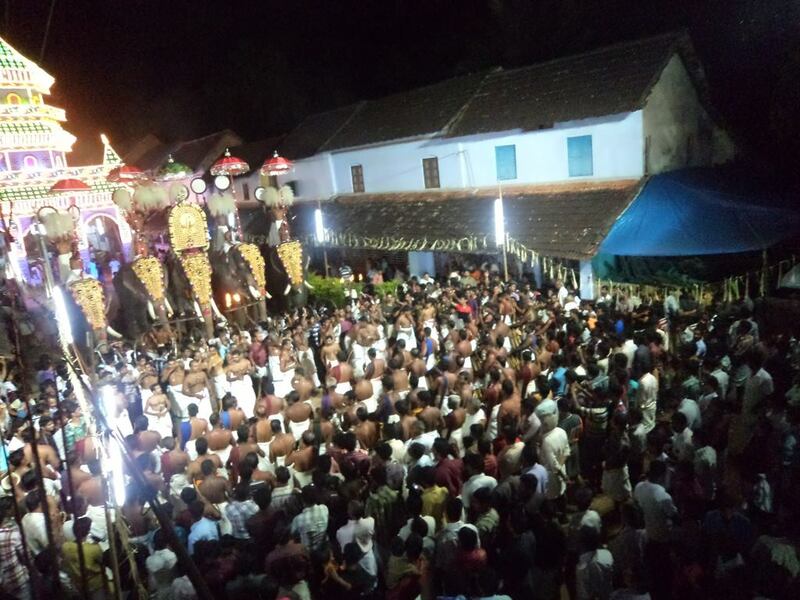 Evening again the festivities resume with the Ezhunnalath and the usual fare of Panchavadyam and Melam with the best of Artistes in their respective genres leading the group. No wonder they say Music is Bliss. 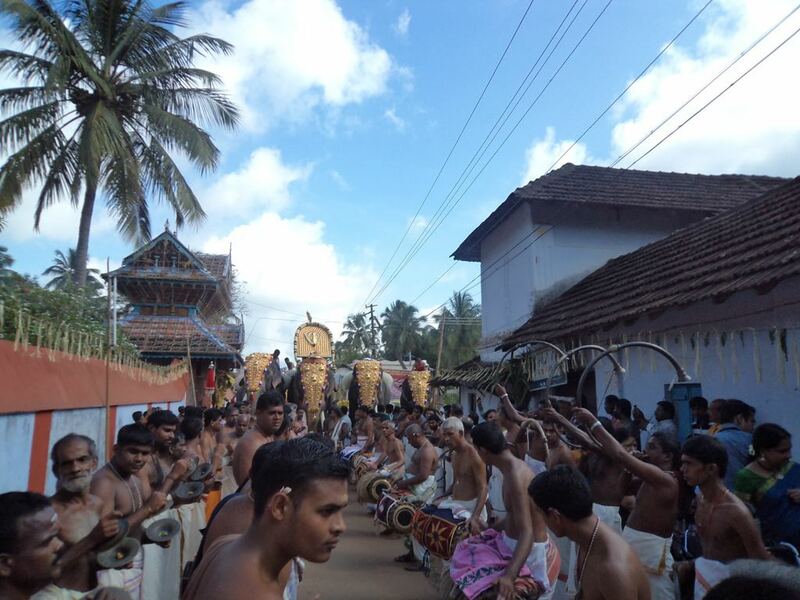 On the tenth day,the Araattu day, it is symbolically a day for all the villages to sign a peace treaty and putting an end to the self proclaimed competition and gather in the temple premises to witness the Lowering of the flag ceremony thus officially putting an end to the nine day long festivities . This day also means that we get back to our boring monotonous lives back in the cities. 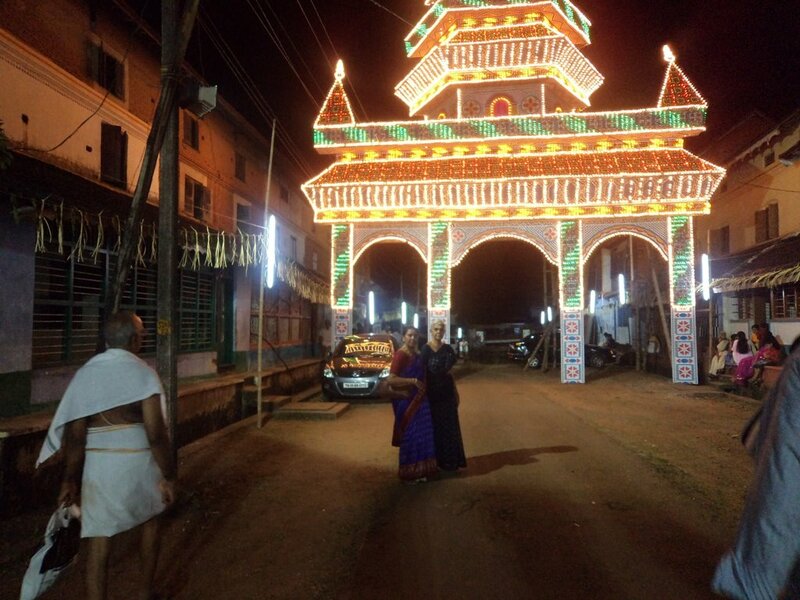 Puthucode Navaratri has many many lovely and charming legends and faces and one has to be present in person in the midst of all these to truly understand and appreciate the awesomeness of it. So, do make it a point to be there at least once in lifetime …coz after that it might be a regular and inevitable affair for you to be a part of it.